Aweber pioneered the autoresponder and is one of the leaders in the email automation segment. The company was started in the year 1998 and has more than 120,000+ customers today. Their email marketing service has been credited with helping businesses grow all around the globe. Aweber is feature rich and provides a lot of emailing options for businesses. The autoresponder is easy to setup and manage. Initially it may be difficult but once you understand the process then it becomes very easy. Now you can even send video messages to your subscribers. 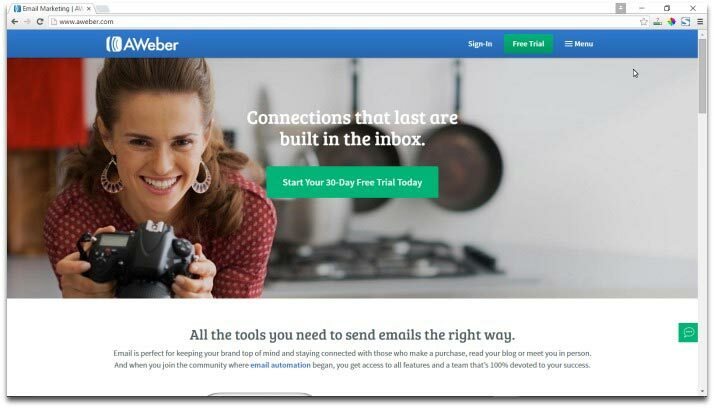 Aweber provides a lot of email templates and sign-up forms and all of them are mobile responsive. Importing data and integrating with other sites like Paypal is quite easy. You can create campaigns using any of the three editors (HTML, WYSIWYG, Text) provided. Campaigns can be set to run in the background and you can forget about them. Businesses can start small by using just the basics and as and when their business grows they can start using all the functionalities that are provided. Once your campaign is in full swing you can get both basic as well as advanced reports to improve your campaigns. Aweber has a strict anti spam policy and businesses need to uphold the standards set by Aweber. Aweber support is another advantage as you get phone support, email support and live chat too. The pricing is a little on the higher side while compared to other providers, but the additional features and templates along with wonderful customer service are worth that little extra. You also get a free 30 day trial with all features enabled to check if the service is the right one for you. Aweber pioneered the autoresponder and is one of the leaders in the email automation segment. The company strives to provide cutting-edge features, high deliverability and fast, friendly customer support. The success of Aweber is not just due to the company being the inventor of autoreponders, it has more to do with the quality of the service being provided. Though the service is priced higher than other competitors, Aweber still maintains a slight edge over them. Customer support is highly appreciated by the customers and this is also one of the reasons for Aweber maintaining its superiority over other similar services. I’ve been with aweber off and on for over 10 years. Even though I have tried different services, aweber seems to be the best choice for me. I really liked Mailchimp but their support is primarily through chat and i prefer calling. I’m like Stan. Tried others but came back to aweber.